Chances are, if you've eaten a few chinese meals or wandered through China town and peered into those intriguing large sacks outside the shops you'll have already encountered something very similar to this tasty morsel. The chinese produce around half a million tonnes of a cultivated relative of this species every year and use it regularly in their cuisine. 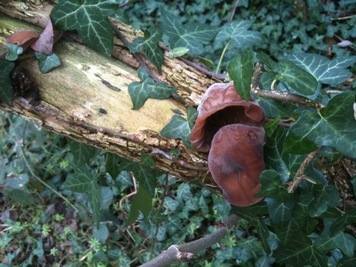 Jews ears or Jelly ears (Auricularia auricula- judae). The foremost name is a reference to its main host -the elder- the unlucky tree upon which Judas Iscariot hung himself in shame. It's an unlikely story and more likely cynical propoganda promoted by the early Church in order to villify what was once a much reveered and celebrated tree in celtic folk lore- but I digress. Name, and to some extent looks, aside this really is a great little mushroom and the only one I know of that can be picked year round. Just look on the underside of old and decaying elders and you should find some pretty easily- these ones were growing along a track near Wick meadows on the edge Bournemouth. They need to be cooked and the best way to prepare them is to dry for a couple of days, cut into chunks with some scissors and them simply add to soups, stews or currys. The pic on the left is after a couple of days on the radiator. As they rehydrate they absorb whatever is in the pot and impart a mild mushroom flavour and slightly chewy texture to the dish. It's difficult to mistake this for anything poisinous. It should have a distinctive ear shape and be growing on an elder tree- use the internet or a book to check what this tree looks like if neccesary (I have found it on other trees but that's fairly unusual). 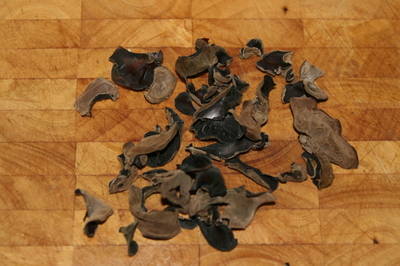 In fact, the real word of warning must be to anyone thinking of frying these in their fresh state. Don't- their high moisture content causes them to explode scattering tiny pieces of scorching hot mushroom around the room!